The SCM muscle helps turn and bend your neck. The sternocleidomastoid is a superficially located neck muscle that plays an important role in tilting your head and turning your neck, as well as other things. It courses from the back of your head and attaches to your breastbone and collar bone. The sternocleidomastoid, often referred to as the SCM, is usually quite easy to see. Visually, it appears as a cylindrical, strap-like shape that emerges from the side of your neck and tapers at the ends. The sternocleidomastoid runs diagonally from the back of the ear to both the collarbone and the breastbone. Unlike other muscles such as the latissimus dorsi, a large muscle in your back, the points of attachment for the SCM muscle are relatively simple to identify and follow. In contrast, to the lats, the SCM only attaches to bones, and to a total of just four bones, at that. One small exception to the simplicity of the SCM attachment pattern is that as the belly of the muscle begins to near the collarbone and breastbone, it branches into two “heads." Based on this, the SCM has two origin points. So from where, exactly, are these two "heads" of the SCM? One attaches on the front (i.e., the anterior surface) of the manubrium. The manubrium is uppermost section of the breastbone. The other head attaches on the top part (called superior aspect) of the collarbone, near the midline of the body. The other end of the SCM inserts on the mastoid process, a little projection of bone located behind your ear. The mastoid process emanates from the temporal bone, which is that part of the skull that forms the temple. You can identify your mastoid process yourself by touching the area behind, and a little below, your ear. Then, if you walk your fingers down a bit you may feel a softer area. That is where the SCM attaches to the mastoid bone. A few fibers of the SCM also insert on the bottom of the occipital bone, which is located right next to the mastoid process, and forms, again, the bottom of, the skull. 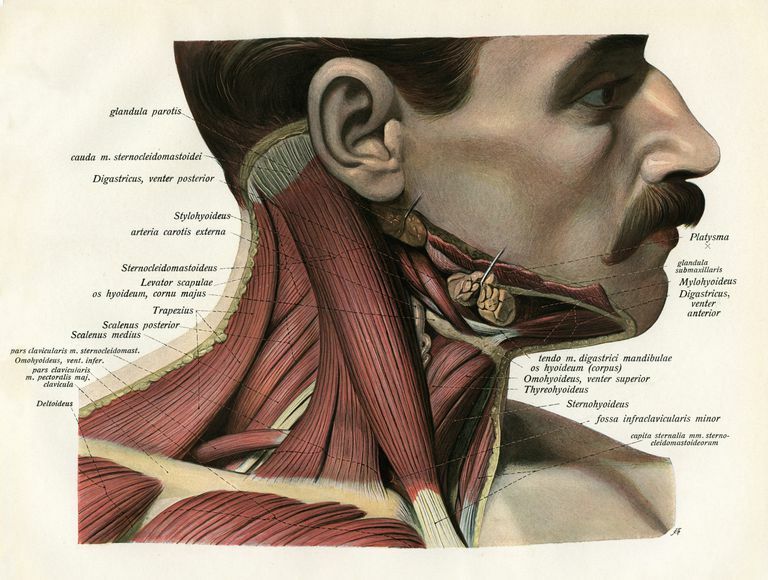 The SCM muscle is of interest to anatomists because the unique position it occupies in the neck makes it key to understanding the layout of cervical muscles. On either side, the SCM diagonally divides the neck musculature into anterior (front) and posterior (back) triangles, making the cervical spine easier to study. The sternocleidomastoid muscle is innervated by the accessory nerve. In part, the neck movements produced by the sterocleiomastoid vary depending on whether one or both of the SCM muscles are working. When just one SCM muscle contracts, it tilts your head to the same side (called the ipsilateral side) to which the muscle is located. For example, the SCM on the right side of your neck tilts your head to your right. One SCM can also turn, or rotate, your head to the opposite side. For example, when you rotate or turn your head to the right, your left SCM is contracting. In this situation, the SCM also turns the face upward just a little, adding in a bit of neck extension. When both SCM muscles contract, the result is a neck extension movement that takes place at your first intervertebral joint. The first intervertebral joint is the topmost spinal joint; it is the place where your head sits on your neck. This extension movement brings the head backward. A contraction of both SCM muscles also flexes your neck, which brings your chin down in the direction of your breastbone. And bilateral SCM muscles contraction thrusts the chin forward when your head is level. Bilateral SCM muscle contraction simultaneously also plays a role in the breathing process. In this case, it lifts up of the manubrium, which is another name for the breastbone. It also lifts the area of the collarbones that are nearest to the midline of the body. The SCM is part of a group of muscles known as the anteriolateral neck flexors. The other muscles in the anteriolateral neck flexor group are the scalenes, which are located more deeply in the neck than the SCM. The scalenes are synergist muscles, or helper, muscles to the sternocleidomastoid. They assist the SCM in turning and tilting both the head and neck. The SCM becomes chronically shortened in cases of torticollis. Torticollis is a condition in which the head is persistently turned to one side. This is often referred to as wry neck. It may occur in babies during early positioning. Treatment involves gentle stretching of a tight SCM muscle to lengthen it to normal shape. Positioning of a baby with torticollis can also help treat the condition. Any impairment or injury to the spinal accessory nerve, or cranial nerve XI, can cause weakness or paralysis to the SCM. This will cause notable atrophy in the affected SCM and may cause difficulty in turning your head and bending your neck. Treatment for this involves regaining normal function of the nerve and strengthening exercises for the SCM muscle. If you have a weakened SCM muscle, it is important to visit your doctor. He or she can perform tests to ensure that you get an accurate diagnosis and start treatment right away. Working with a physical therapist can be a useful modality to rehab the SCM. Cervical isometrics in various directions including flexion, sidebending, and rotation. By working to keep good posture and to gently stretch and strengthen the SCM and other muscles around your neck, you can be sure to quickly recover full pain free function. Kapandji, I.A., "The Physiology of the Joints". Fifth Edition. Churchill Livingstone. English Edition 1987. New York. Moore, Keith, L., Dalley, Arthur, F. Clinically Oriented Anatomy. 5th Edition. 2006 Lippincott, Williams and Wilkins.